South-Easterlies in Port Phillip Bay? Tomorrow's looking strong for South-Easterlies. Where's the go for Port Phillip Bay (eastern side)? Does Ricketts work? Too onshore? Ricketts is pretty good in a SE. Bumpy, the reef doesn't protect the inside like it does in a W. Watch out for the reef, particularly at low tide. Sometimes easier to rig up on the road and carry gear down the stairs at the E end of the beach in an SE. No good if it goes around NE. Might see you there. An overnighter somewhere down the E coast or the island is looking like a good option given the wind looks like it'll stay 'til morning. An eighteen strong crew out at Ricketts this afternoon/evening. Good times on a school night and a great start to the week! Doh! Tactical error. 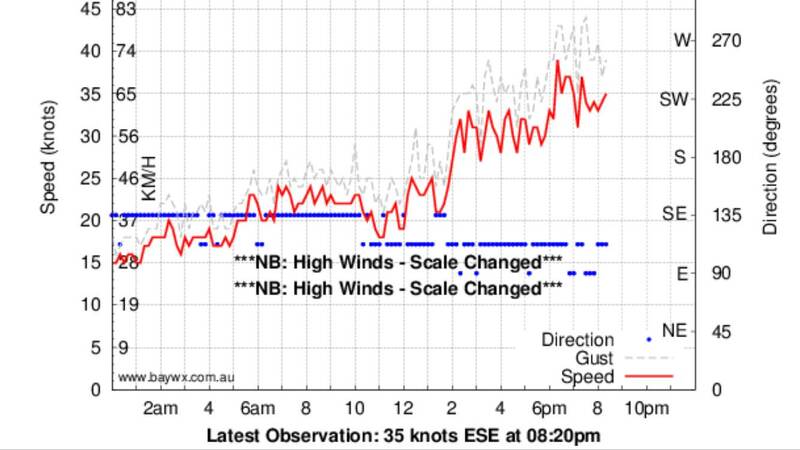 Missed the incoming tide @ Flinders in the morning, too choppy to be fun in the evening. Should've gone to Ricketts with everyone else by the sounds of if. Still some breeze at South Channel, all gone up here though.